Let's say that, at minimum, you fire up your website analytics tool once a month. You probably look over the metrics to get a feel for what kind of traffic your website is getting, with visits and page views held in high esteem. And I’m sure you’re looking at where the website traffic is coming from, too. All of that search engine optimization (SEO) work you did a few months ago better be paying off, right? There might be a few analytic components you’re overlooking, though. 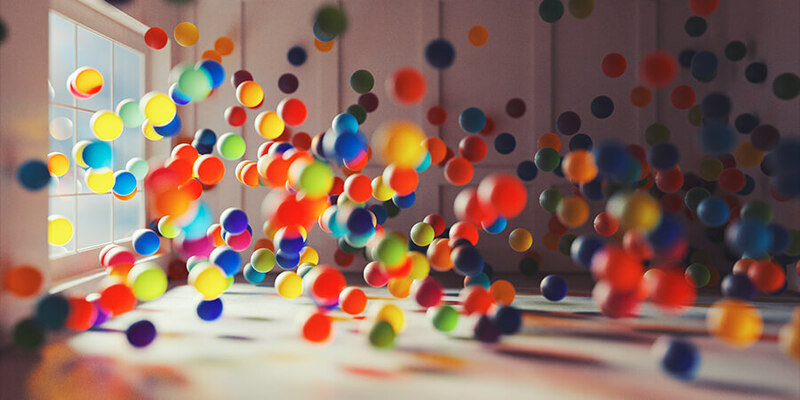 Have you paid much attention to the bounce rate that your site is experiencing or maybe even the average amount of time visitors spend on your pages? If not, you’re not alone. Bounce rates and the average time spent on pages often get overlooked and aren't considered “important” analytics by many. The truth, though, is that both of those metrics give deeper insights into how visitors are interacting with your site. What Do Bounce Rate and Average Time On Page Mean? Alright, let’s get some definitions out of the way so we’re speaking the same lingo. The technical definition of bounce rate from HubSpot is, “the percentage of people who land on a page on your website and then leave without clicking on anything else or navigating to any other pages on your site.” An example of this would be someone finding one of your blogs on a search engine results page (SERP) such as Google, clicking on it, reading the post, and then not visiting any other pages on your site. Average time on page is much easier to understand. This is just an average amount of time all visitors spend on a particular page. Pretty self explanatory, right? What we’ve got here is a good metric to see if visitors are actually reading your content. For instance, if the average time on page for a lengthy blog post is only 10 seconds, it’s safe to assume that most visitors aren’t actually reading the post…unless all your visitors are speed readers. What Are Good Numbers For Bounce Rate and Average Time On Page? There isn’t a golden number for bounce rate or average time on page. Also, many factors can go into these metrics, such as what kind of traffic your site is attracting and the SEO that’s been done. 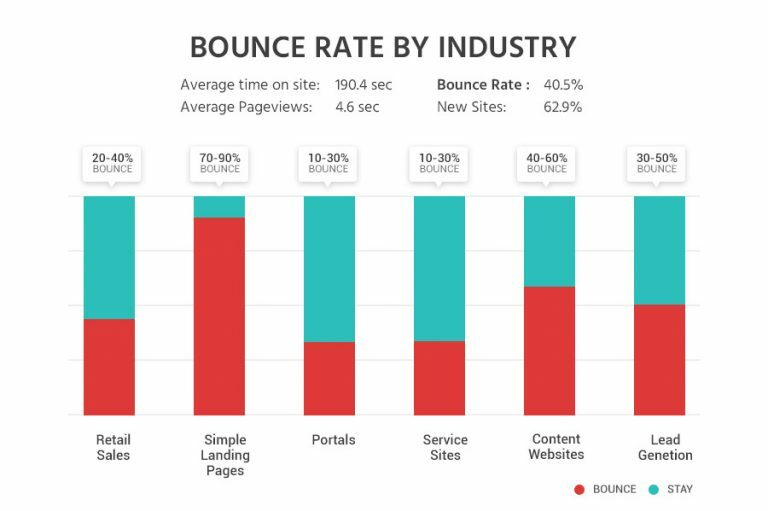 To get an idea of the variations in bounce rate, check out this graph created by ITX Design showing the average bounce rate for various industry web pages. In general, you should aim for a bounce rate below 40%. If it’s above 55%, you definitely need to look for reasons why people may be leaving your site and for ways to improve. HubSpot has some great insights into why visitors may not be sticking around, but a large factor is what kind of page they're looking at and its content. If the page is largely informational without many links to other parts of your site, then a bounce rate above 55% may not be too alarming. However, if the page is mainly a directory of links to, say, products you make or services you offer, then you should see a much lower bounce rate. The ideal average for time spent on a page will vary. As mentioned, a short average time for a blog post or a page with lots of content is suspicious and definitely not good news. You’ll need to use your intuition for each page to figure out how long you think someone should be on it. If someone is staying, on average, for 40-50 seconds, consider that a good start. It may not sound like much, but try browsing the web with your morning coffee and have a stopwatch going (sounds crazy, I know, but consider it an experiment). Start and stop it for each page you go to. This will give you a good idea of how much time you’re spending on certain types — and you might be surprised at how little time was actually spent on each. Mobile. You're likely among the 77% of adults in the U.S. who own a smartphone and know how difficult it can be to do extensive research on a small device. Therefore, more people are likely to bounce sooner when using a mobile device rather than a computer or tablet. This is just another reason why it’s important to optimize your website for mobile so that it’s easier for people to navigate and read text on your website. Popular blog posts. While blogs that rank high in search engines and are frequently shared throughout the internet and social media platforms may attract a lot of traffic, that traffic is likely going to be looking for answers to a specific question. Sure, blogs are often considered the front door of your website that greet people as they arrive and answer their questions. Once they’ve found answers, however, most people bounce to other sites in search of other perspectives. Social traffic. The traffic you acquire from social media typically isn't comprised of prospects looking to research your company and its products and services, so they tend to have a higher bounce rate. Some pages are loved more than others. When looking at your analytics, there may be a disproportionate amount of time spent on different pages. For example, single CTA landing pages are likely to have a much higher bounce rate than in-depth content pages. Structural issues. If you have extremely high bounce rates (more than 70%), then try to look at your pages from a visitor’s perspective. Maybe there’s something obviously wrong that you couldn’t see from your analytic viewpoint. Make sure there’s not an error, like a 404 error page, and that the content of your page matches your meta description. These are some quick and easy fixes. None of the above items apply to your webpage? Let’s check out some more serious issues. My Metrics are Horrible! What Do I Do? Don’t panic! Some crafty work can easily remedy a high bounce rate and/or low average time on page. If your bounce rate is high, the first place to look is your site design. Make sure links are easily identifiable, relevant and intuitive on each page. Main site navigation links should be located on every page of your site, with the exception of landing pages. The aesthetics of your site should also be up-to-date since an ugly or out-of-date site can cause a user to instantly turn away. Face it, flashy confetti .gif animations on the sidebar aren't as appealing as they were a decade ago. SEO is another place to look if your bounce rate is through the roof. Make sure you’re using relevant keywords, page descriptions and titles throughout your site. It’s great to generate a large number of visitors, but if they aren’t sticking around, you’re missing opportunities to engage them further. Look at how long it takes to load pages on your site. If you have a ton of large, high-resolution images, pages may take too long to load. People are impatient and will most likely hop off your page and go onto the next if the load time is excessive. Many of the same tricks can be used to improve your average time on page as well. Finally, write amazing (and relevant) content! It will help you see the largest improvements because visitors will be more likely to stick around and read what you have to offer. Don’t use large bodies of text. It can be difficult to read, so break it up! Use section headings to break up text and make it easier for visitors to navigate a page. Don’t use pop-ups, they’re annoying. Regularly write and repurpose blog content, advanced content and press releases. Use keywords and long-tail keywords that your prospects will enter into search engines to ensure high quality traffic. Carefully craft your meta descriptions because that’s what people will view before they click on your page. Create enticing Call-to-Action (CTA) and Landing Pages to draw visitors into your meaty, in-depth content. Improving your website's bounce rate and average time on page will ultimately improve your SEO. There are lots more ways to improve your rankings in search engines, and we've outlined them in our SEO Survival Guide. Get your copy today by clicking the link below, and see how leveraging analytics and the insights gained from them can help you tailor your site and improve user experiences.